The University of Ulster has welcomed members of the Northern Ireland Assembly Committee for Education to the Coleraine campus. MLAs, including Committee Chairman Mervyn Storey, swapped the traditional backdrop of Stormont for the School of Education’s PGCE Primary teaching room, in which to conduct their weekly business. Committee members welcomed presentations from the Vice-Chancellor, Professor Richard Barnett, Professor Linda Clarke, Head of the School of Education, and Dr Sam McGuinness, Head of the School of Education Designate. 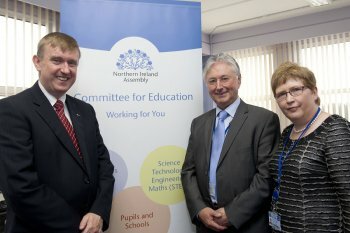 The Committee heard about the University’s unique suite of initial teacher education provision for primary schools, post primary schools and the further education sector. The School of Education’s vision for career-long Continuing Professional Development for teachers was also shared, with a particular emphasis on new course provision for Middle Leadership and Headship. Finally, the Committee was told of particular strengths in research, highlighting the work of the UNESCO Centre’s Children and Youth project and the Creative Change Project which is working in partnership with ten local primary schools. Following the formal Committee meeting, MLAs had the opportunity to tour the School of Education’s facilities and meet with some of the primary and post-primary students. They met student teachers in the PGCE Primary cohort who had a series of questions for the visiting MLAs. They also met students and tutors within the Post Primary Religious Education specialism who are uniquely taught in integrated classes following a curriculum approved by all of the main churches. Professor Linda Clarke, Head of the School of Education, said: “We were delighted to host the Stormont Committee for Education in this School today and to share our vision for a future North West School of Education. The Committee showed considerable interest in our innovative, research-based course provision which offers career-long support for schools and teachers."